High school students across the country are enjoying their first few weeks of summer vacation after a long school year, and university students are already several weeks deep into their well-deserved break from classes. If you’re in either of these groups, anything resembling schoolwork is likely the last thing on your mind. However, now is the perfect time to start considering what books you might want to crack open this summer, whether or not you have any official summer reading assigned. As we’ve discussed in previous blogs, students who suspend all reading during the summer months often suffer from summer slide, and people who read purely for recreational purposes enjoy a wide range of benefits. Based on the huge body of evidence supporting the value of books, there’s no reason not to make the summer of 2017 the season when you reintroduce recreational reading to your life. Of course, one reason which many teenagers (understandably) cite is a lack of motivation. 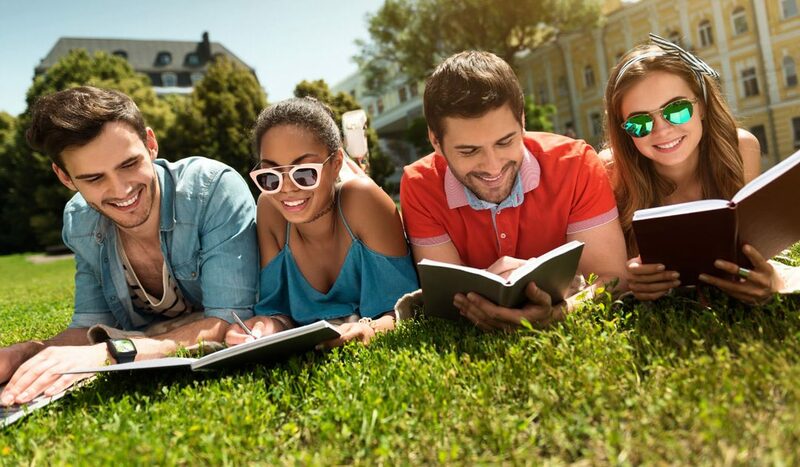 High school and higher ed students have plenty of demands to juggle, and many students choose not to spend their limited free time with a book in their hands. Fortunately, there are plenty of techniques that can help you get hyped about reading, and one of my favourites is to create a personal reading challenge. Rather than just picking a number of books to read, draft a list of specific challenges, like ‘a book set on a train,’ ‘a book chosen by a friend,’ or ‘a book published in 1985.’ These kinds of prompts provide the perfect amount of structure: you have an engaging idea to get you started, but you’re still free to choose from a huge range of options. Although the number and type of prompts you can come up with are essentially limitless, here are a few suggestions to ensure your summer reading list is as enriching as possible. A book in a format you’re not familiar with. When most people hear ‘book,’ their minds jump right to the image of dense passages of text crammed onto a few hundred pages. However, books are as diverse as the people who write them, and there are plenty of formats out there that you may never have explored. I’ve written about graphic novels in the past, but there’s also a special place in my heart for verse novels–plot arcs told through a progression of poems. (If you need a place to start with the genre, try the modern classic Crank or check out the work of Sonya Sones, queen of the verse novel.) That doesn’t even scratch the surface of unconventional formats, though–for instance, you could try picking up a hilarious choose-your-own-adventure version of Hamlet or an experimental novel where different letters of the alphabet are gradually eliminated from use as the story goes on. Even if the format you try this summer doesn’t hook you on a new genre, it will definitely expand your definition of what a book can be. A book related to a career that interests you. When I was in high school, one of my greatest sources of stress was the idea that I had to choose my future career at a point when I had no idea what life in the real world might resemble, and that feeling doesn’t really go away in university. Books can be a great resource for building a mental picture of a career, even (or perhaps especially) if the story is fictional. Reading about a protagonist with your dream career (or any job that seems cool) can provide a literary level of detail about their day-to-day experiences while simultaneously pulling you in to a compelling plot. For example, Terry Fallis’ The Best-Laid Plans provides a detailed account of what it’s like to work as a member of Canadian Parliament, Six Feet Over It describes the responsibilities of a funeral director, and Get It Together, Delilah! gives insight into small business ownership and the entrepreneurial experience. Whether picking up a summer read with an interesting job in the foreground helps you conceptualize a future path or just helps pass the time, it’s a great theme to explore. A book written by an author with a background substantially different to your own. As demonstrated by initiatives such as We Need Diverse Books, there’s a shocking lack of diversity in fiction, and these industry shortcomings have serious consequences. You can help broaden your own horizons this summer by searching out the work of authors with backgrounds that differ from your own, whether the difference lies in their race, sexuality, gender identity, religion, ability, or any combination of defining factors. In an interview about diverse books, Book Riot contributor Swapna Krishna describes how she likes to read about different cultures because it makes her feel “smarter, sharper, broader minded, and just a better human being,” while contributor Preeti Chhibber observed that “pragmatically, more people reading diversely means more diverse books being published.” Considering the extent of the benefits–both personal and large-scale–there’s no reason not to dive into some diverse books this summer. A book set in your home state or province–and one set far away. It’s always exciting to find elements in fiction that echo your personal experiences, and one way you can seek out relatable books is by focusing on geographical location. You’ve likely read a novel set in your home country, but have you read one set in your home state/province or home town? Once you start digging, you’ll be surprised how specific you can get–a quick search for my hometown of Hamilton, Ontario turned up a list of 27 books set against a very familiar backdrop. As a second part to this challenge, try seeking out a book set in a location you can hardly imagine, such as Kabul, Afghanistan; the Netherlands; or a research station in Antarctica. Just as with the challenge above, familiarizing yourself with a foreign location and culture through fiction is a valuable exercise that can help expand your sense of empathy and your understanding of social issues that don’t directly affect your life. To help you out with either quest, here’s a list of English books from every US state, every Canadian province, and every country in the world.